Discounted Shop Presses by American Forge and Foundry. AFF 812 Floor Press is designed for light duty applications and includes 7 level bed adjustment. 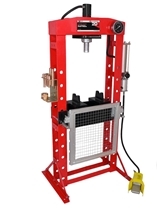 AFF 832A Shop Press is for Automotive and light industrial use. It has eight level bed adjustment. AFF 820A Shop Press is 20 Ton and for Auto and Light Industrial Use. 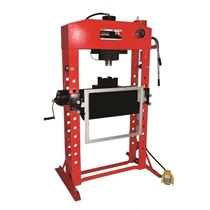 AFF 850ASD Super Duty Shop Press is for a Professional Automotive shop or the Industrial customer with lighter requirements for a shop press. 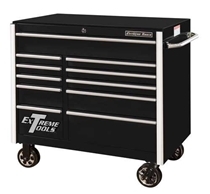 AFF Shop Presses, both bench and floor style, are used in repair shops for the removal and installation of gears, bushings and bearings, as well as with metal bending, straightening, compression and flattening applications. 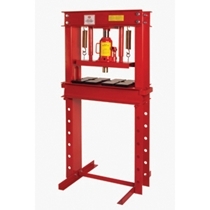 AFF 852SD 30 ton Shop Press is for a professional automotive shop, smaller heavy duty truck service and the industrial customer with lighter requirements for a shop press. 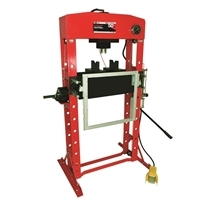 AFF 854ASD is a 50 ton super duty shop press with welded frame for additional strength, and a flexible press head that moves from side to side for greater range. 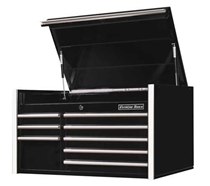 AFF 856ASD Super Duty Shop Press has welded frame for added strength and features an HD cable winch for raising and lowering press bed. 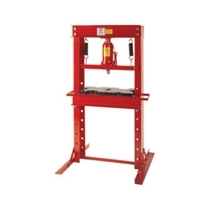 AFF 859SD 100 Ton Shop Press has a welded frame and heavier gauge steel making it ideal for heavy duty truck applications, spring shops, industrial, or shops that need a “step up” from a regular duty press.